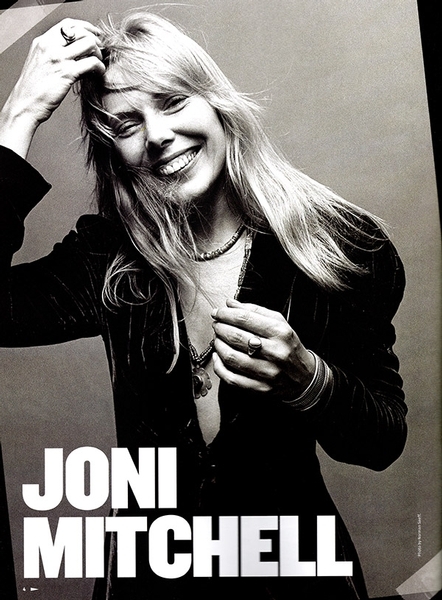 Les Irvin of JoniMitchell.com was asked to write a 400 word bio of Joni for the upcoming Joni 75 booklet. Not all that confident in his writing skills, he asked Mark Scott to submit one as well. Both were then placed in front of Joni for her approval. Joni liked part of one and part of another. Those parts were combined and published - with a few edits by The Music Center staff - in the program booklet. Roberta Joan Anderson was born in Fort MacLeod, Alberta on November 7, 1943. An only child, Joni's artistic talents blossomed early as she began drawing as a young child. Always a lover of music, it wasn't until high school in Saskatoon, Saskatchewan that Joni began performing. She bought a ukulele and soon began playing in the local club, The Louis Riel, in 1962. Heading to art school in Calgary after graduation, Joni auditioned at a coffeehouse called The Depression and immediately landed a regular gig there. Weighing two viable career options - art or music - she decided to focus on the latter. Joni moved to Toronto in 1964 and immersed herself in the fledgling Yorkville folk scene - performing in coffeehouses along with other fellow unknowns Neil Young and Gordon Lightfoot. It was during this time that Joni's songwriting skills began to emerge. Moving stateside in 1965, Joni worked the coffeehouse circuit for the next three years - playing as many as twenty sets a week. David Crosby caught her performance in a Florida club in 1967, was 'stunned' by her talent, and invited her to Los Angeles. Soon thereafter Joni signed with Reprise Records. Her first record, 'Song to a Seagull' was released in 1968. A wholly original masterpiece buoyed by her unique songwriting and guitar style, this album still sounds fresh and timeless 50 years on. Joni Mitchell went on to serve as producer for most of her subsequent albums. She produced and recorded 'Blue' , a unique collection of songs, performed with an emotional honesty that resonated with a wide audience. 'Blue' is considered by many critics to be one of the best LPs of pop music ever created. Joni's most commercially successful LP, 'Court and Spark'  was created with the jazz-fusion group The LA Express. 'The Hissing of Summer Lawns'  steered her away from traditional pop forms into formats of complex lyrics and melodies, accompanied by a variety of jazz musicians. Her album 'Hejira'  shed much of the instrumentation creating a minimalist recording with an expansive ambience achieved with the help of her sound engineer, Henry Lewy, by overdubbing Joni's electric rhythm guitar. In 1978 one of jazz's great geniuses, Charles Mingus approached Joni to propose a collaboration. The result was 'Mingus' , released shortly after Mingus's untimely death from ALS. 'Dog Eat Dog  featured Joni's exploration of sociopolitical themes set to complex synthesizer arrangements. In the 1990s her acoustic guitar playing came back to the forefront and produced the Grammy winning 'Turbulent Indigo' . She has also recorded an orchestral retrospective, 'Travelogue' , two live recordings, 'Miles of Aisles'  and 'Shadows and Light' , and an orchestrated collection of popular music standards,' Both Sides Now' . In 2007 the Alberta Ballet Company staged the ballet 'The Fiddle and the Drum', choreographed to a collection of Joni Mitchell's recordings. Her last recording of new material was 'Shine' . Although Joni's sophisticated music rarely ascended the pop charts ('Help Me' reached #7 in 1974), many of her songs have become classics. 'River', 'Big Yellow Taxi', and 'A Case of You' are instantly recognizable. 'Woodstock' has become the anthem of the 60's counter-culture movement and 'Both Sides Now' has been recorded more than 1250 times by other artists. Three Junos, nine Grammys (plus their Lifetime Achievement Award), the Governor General's Award for Lifetime Artistic Achievement, the Canadian Music Hall of Fame and Songwriter's Hall of Fame, the Rock and Roll Hall of Fame, and a Polar Music Prize are but a few of Joni's awards and accolades. All told, Joni's creative output includes 30+ musical releases and countless paintings and drawings. She continues to create to this day. This article has been viewed 467 times since being added on November 10, 2018.